Kate and Chelsie: Paris Fashion week: "Fashion High Tea"
Its PARIS fashion week and how would we spend it apart from gazing at everything all those fabulous designers have to offer, well with an afternoon tea of course ! and the Fashion Afternoon Tea at Hotel Le Bristol in Paris seems like a perfect option, Le Bristol is luxury 5-star hotel located on Paris fashionable rue du Faubourg Saint-Honoré, and boasts a 3-Michelin star restaurant. And how would a fashion esta love to spend her time at afternoon tea well watching a fashion show of course, Hotel Le Bristol showcases different designers on different dates from past designers such as stella mcartney, so why not let your palate be treated to tasty finger sandwiches and patisseries all why watching models parade around in houte couture and Did we mention the dessert is created by top Pastry Chef Laurent Jeannin that's inspired by the designer's collection? American designer Ralph Lauren will showcase his Spring 2012 creations at Paris’s Le Bristol palace hotel on Saturday 10th March for the Fashion Tea Time – a gourmet afternoon tea combined with luxury fashion. Best known for his definitive all-American lifestyle trademark, the high-end brand will follow in the footsteps of global fashion houses including Yves Saint-Laurent, Givenchy, Chloé, Lacroix, Céline and Ungaro and more recently, British designer Stella McCartney. Especially for the occasion, the hotel’s Pastry Chef, Laurent Jeannin - Chef of the year 2011 - will create aspecial cake to complement the designer for guests to enjoy which will be accompanied by a selection of fifteen teas. The Spring 2012 collection will be showcased in the legendary bar at the prestigious hotel located in the heart of rue du Faubourg St Honoré, one of Paris’s chicest shopping streets, from 3.30pm-5pm. Hotel le Bristol recently unveiled the completion of Spa Le Bristol by La Prairie, two new signature suites and Epicure, the newly decorated 3 star Michelin restaurant, formerly the ‘Gastronomique’. The launch heralds the completion of a €100 million three year restoration programme. 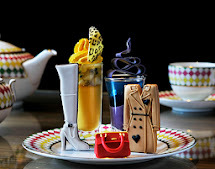 Fashion Tea Time at Le Bristol costs €55 per person. The event gets booked up fast with people on a waiting list to attend the event so get you place fast !